Paul Klee posed himself a number of questions that change over time. He therefore did not progress in a straight line as he jumped backwards and forwards. He does not produce a large public work that summarises his progress. His entire work can be seen as a masterpiece rather than a set of individual works. He moved between abstraction and representation. There are 3500 works by Klee and 3,500 pages of text – The Thinking Eye and The Nature of Nature and the Pedagogical Notebooks. There are 170 easel paintings. His theory and practice are in constant dialog. His work therefore cannot be divided into sketch and finished work. When he started he wanted to develop and consolidate his skills as a draughtsmen (Fauvism is about the dislocation of the colour from the physical reality and colour becomes an independent aspect). Slides 3 and 4. If an artist is not mimetic then they must decide on the relationship between form and colour. 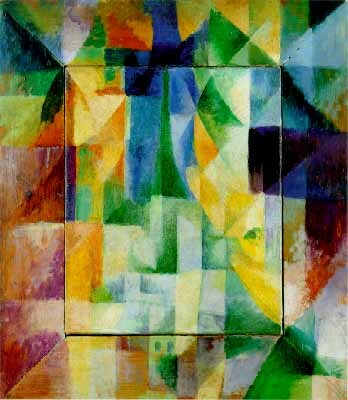 Delaunay (an “orphic-cubist”) painting of the Eiffel Tower. Bergmans ideas of simultaneity and the colour theory of Seurat. 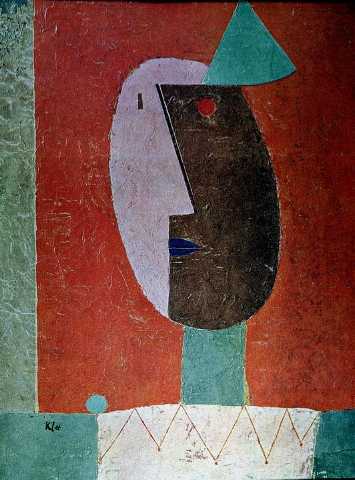 Klee started to develop post-cubist colour theory. 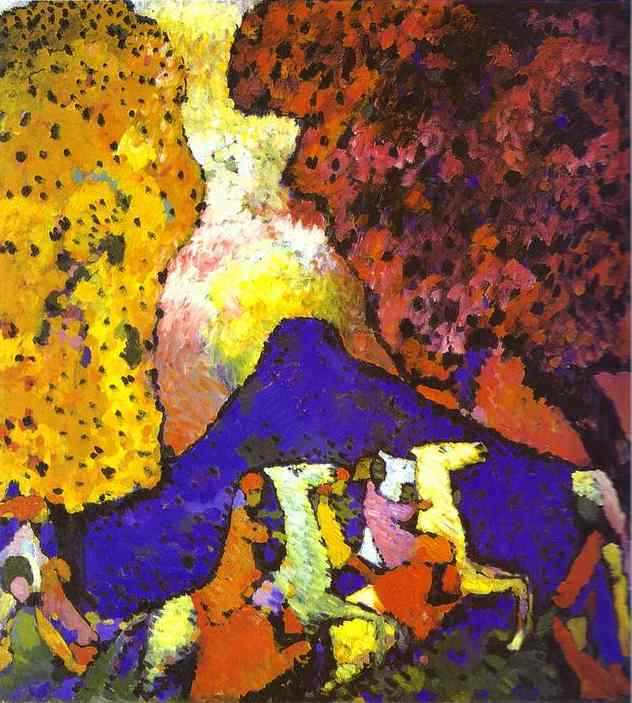 Marc, Red Horses, and Kandinsky, Blue Mountain, (spiritual overtones of the colour blue and the Blue Rider group.) Blue is related to the Mandonna and his ideas of Theosophy. 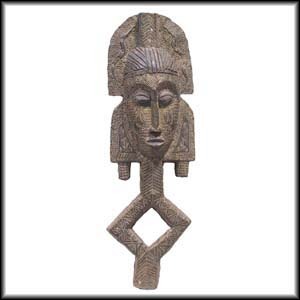 If you are working outside the mimetic then you will be interested in groups that also work outside this western idea such as primitive art, children’s art and the work of the mentally ill. “Purely decorative” has been used as a term of abuse for early 20th century art. The artists were not trying to be decorative. Photographic techniques usurped the mimetic role of painting but also introduced new ways of seeing such as time lapse and X-ray photos. Given Nietsche announcement that “god is dead” and the gender role changes because of industrialisation and the publications of Freud and science, artists tried to find a fixed point inside themselves. If they failed it was not for want of trying. Dancing from Fear (or Outbreak of Fear) is trying to find fundamentals (Malevich and Mondrian were trying to simplify the world — e.g. to a black square). 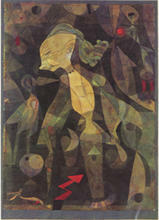 “On Modern Art” Edited by Herbert Read has a section by Klee. Klee says the artist is like a tree. Painting is about forming not forms, drawing is taking a line for a walk. Burgson was interested in becoming and the sense of self configured by the past and a prediction off the future. 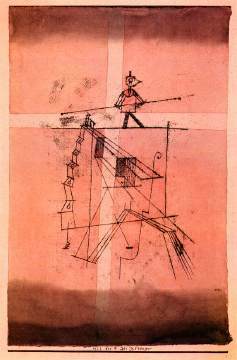 Klee – art makes visible. Hitler slide. Revolt of the Viaducts. Viaducts were invented by the Romans and the connection between Romans and Hitler is joked about by Klee. 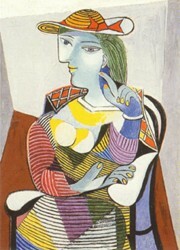 Cubism is vital to understand 20th century art. Clown relates to profile and frontal image. Senecio – mountain over eye. Outbreak of Fear III, a kit for a human being, identity is much harder to pin down. Stephan Vigue (?) book — title? 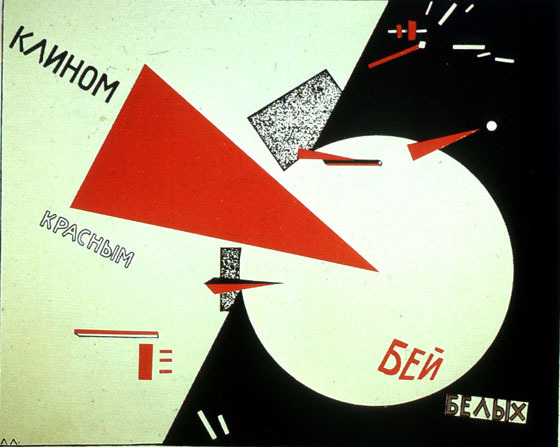 Lissitsky. Tries to communicate to the illiterate across Russia with a universal image. Klee – Severing the Snake. Klee’s Pedagogical Sketchbook describes the line and the creation of a plane. The movement off a point, the arrow and the division of a line as in music. Klee was a musician and chose to become an artist to solve the problems of non-representational art. Principles of Harmonic Counterpoint. Pictures of ships are related to the visual representation of music. Music is the perfect example of an abstract art form so was thought to have a lot to teach abstract art. Support for a Sign, 1934, learn. Drawing with a Fermata (which is a pause in music represented by a semicircle over a dot – there the conductor has the discretion to pause as long as he wants). The pause over the bird as well as the moon (waxing or waning?). Three Subjects Polyphony. Crystal Graduations and Fugue in Red allows a series of relationships to be represented. A canon is the same melody repeated after an interval, a fugue is a more complex canon. The structure of repeated elements, some of them shown upside down is represented in the paintings. The grid is a common theme in 20th century art. Four pictures to show Klee playing with the theme. 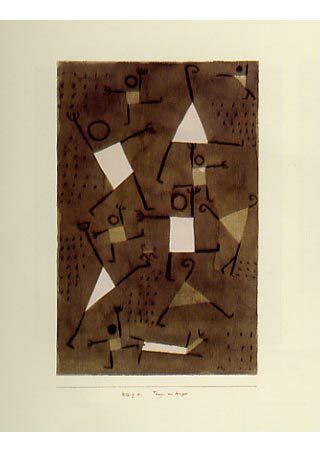 Klee tried to represent the chord in music, the problem is in painting the colours merge. Klee’s Canon of Colour Totality. Ad Parnaseum – seat to the gods – god of music but not painting. 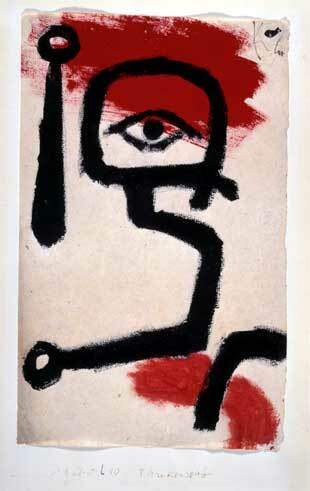 So Klee aspires to create a god of painting. Fuch’s treatise on Parnassum. Disease turned his skin into a carapace until he suffocated. In his last few years his movements became increasingly limited. Fish Magic is one of his greatest works. The square area is a painting within a painting. Clowns are Janus faced. Clock shows when the painting was made. The notion of time which is suspended. Fish were a sign of two types of rhythm – repetitive and rhythmic – so it can in move between the two worlds. The moon, sun and the flowers images. 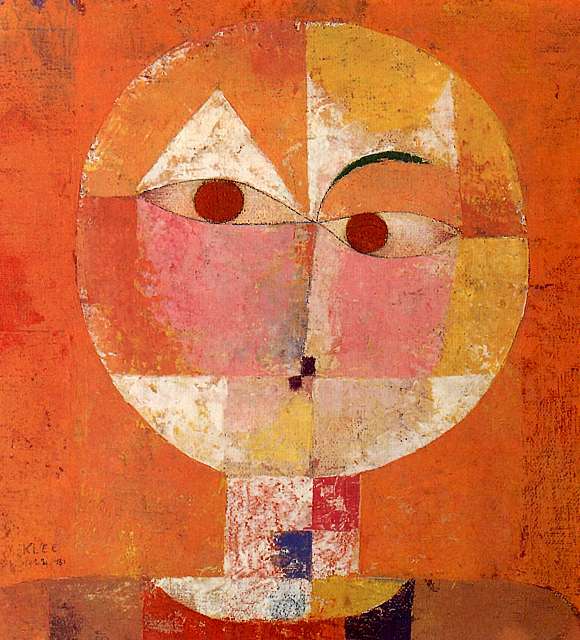 Biography from WebMuseum: A Swiss-born painter and graphic artist whose personal, often gently humorous works are replete with allusions to dreams, music, and poetry, Paul Klee, b. Dec. 18, 1879, d. June 29, 1940, is difficult to classify. Primitive art, surrealism, cubism, and children’s art all seem blended into his small-scale, delicate paintings, watercolors, and drawings. Klee grew up in a musical family and was himself a violinist. After much hesitation he chose to study art, not music, and he attended the Munich Academy in 1900. There his teacher was the popular symbolist and society painter Franz von STUCK. Klee later toured Italy (1901-02), responding enthusiastically to Early Christian and Byzantine art. 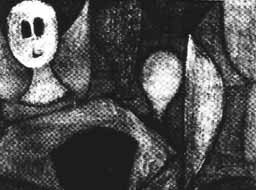 Klee’s early works are mostly etchings and pen-and-ink drawings. These combine satirical, grotesque, and surreal elements and reveal the influence of Francisco de Goya and James Ensor, both of whom Klee admired. 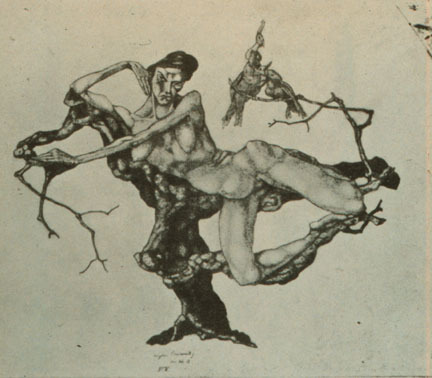 Two of his best-known etchings, dating from 1903, are Virgin in a Tree and Two Men Meet, Each Believing the Other to Be of Higher Rank. Such peculiar, evocative titles are characteristic of Klee and give his works an added dimension of meaning. After his marriage in 1906 to the pianist Lili Stumpf, Klee settled in Munich, then an important center for avant-garde art. That same year he exhibited his etchings for the first time. 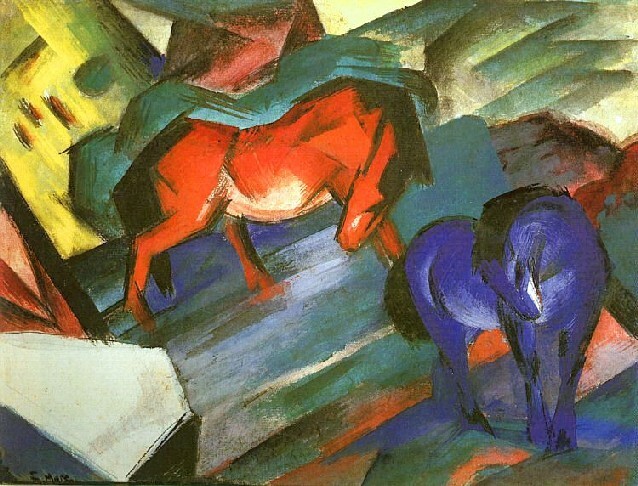 His friendship with the painters Wassily Kandinsky and August Macke prompted him to join Der Blaue Reiter (The Blue Rider), an expressionist group that contributed much to the development of abstract art. A turning point in Klee’s career was his visit to Tunisia with Macke and Louis Molliet in 1914. He was so overwhelmed by the intense light there that he wrote: Color has taken possession of me; no longer do I have to chase after it, I know that it has hold of me forever. That is the significance of this blessed moment. Color and I are one. I am a painter. He now built up compositions of colored squares that have the radiance of the mosaics he saw on his Italian sojourn. The watercolor Red and White Domes (1914; Collection of Clifford Odets, New York City) is distinctive of this period. 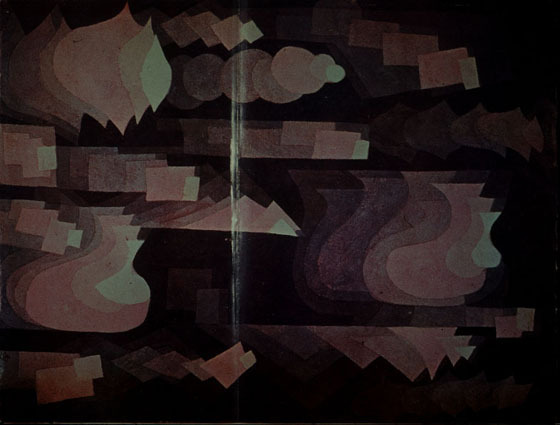 Klee often incorporated letters and numerals into his paintings, as in Once Emerged from the Gray of Night (1917-18; Klee Foundation, Berlin). These, part of Klee’s complex language of symbols and signs, are drawn from the unconscious and used to obtain a poetic amalgam of abstraction and reality. He wrote that “Art does not reproduce the visible, it makes visible,” and he pursued this goal in a wide range of media using an amazingly inventive battery of techniques. Line and color predominate with Klee, but he also produced series of works that explore mosaic and other effects. Klee taught at the BAUHAUS school after World War I, where his friend Kandinsky was also a faculty member. In Pedagogical Sketchbook (1925), one of his several important essays on art theory, Klee tried to define and analyze the primary visual elements and the ways in which they could be applied. In 1931 he began teaching at Dusseldorf Academy, but he was dismissed by the Nazis, who termed his work “degenerate”. In 1933, Klee went to Switzerland. There he came down with the crippling collagen disease scleroderma, which forced him to develop a simpler style and eventually killed him. 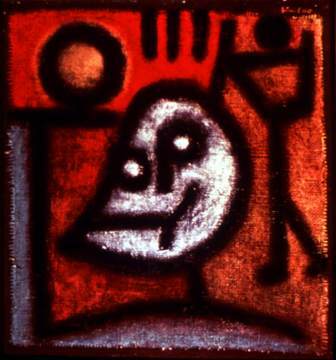 The late works, characterized by heavy black lines, are often reflections on death and war, but his last painting, Still Life (1940; Felix Klee collection, Bern), is a serene summation of his life’s concerns as a creator. 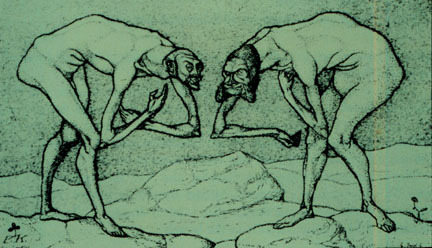 Slide 3: Two Men Meet, Each Believing the Other to be of Higher Rank, etching, (1903-05).